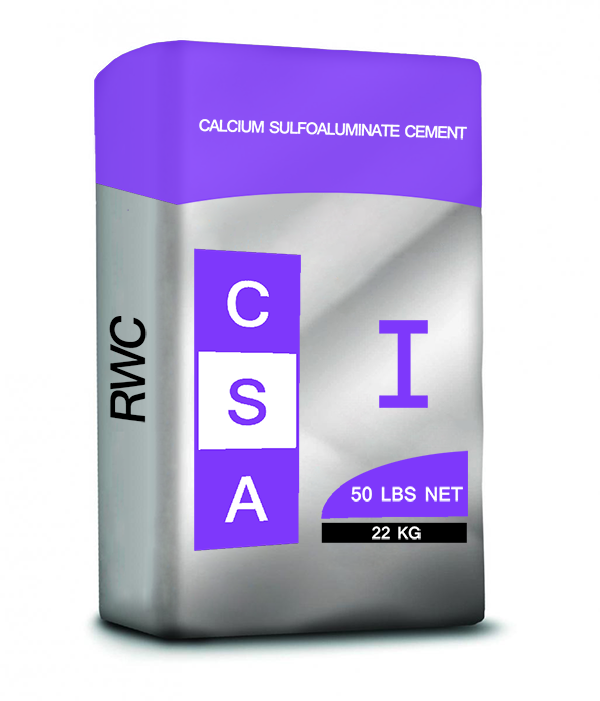 Calcium Sulfoaluminate (CSA) is a specialty cement used in many applications where high early strength and fast setting development are necessary, such as bridge decks, airport runways, patching roadways, DOT work, tunneling, etc. CSA cements may also be used to manufacture shrinkage compensated or low shrinkage concretes, grouts and mortars. High Early Strength / Rapid Setting: The primary advantage of CSA cements is that concretes, grouts and mortars made with CSA Cement, can easily be formulated to achieve compressive strengths in excess of 5000 psi in just a few hours. With CSA Cement is possible to attain desired 28 day strength in 24 hours. Rapid setting and high early strength gain is critical in situations where an airport runway, a bridge repair or a damaged freeway must be returned to service in a very short amount of time. Green Technology / Low Carbon Footprint: A key feature of CSA cements when it comes to the environment and Green Technology is in the difference in the amount of energy used to product CSA Cement and Portland cement. Portland cement requires kiln temperatures of around 1500°C (2700°F), whereas CSA cements requires only around 1250°C (2250°F). The CSA clinker is softer than OPC clinker, requiring less energy at the mill to grind it and significant lower energy to run through the kiln. Non-Shrinkage, Low-Shrinkage: Because CSA cement based materials achieve a greater high early strength than pure Portland cement products, it is possible to formulate materials that qualify as Low-Shrinkage or Non-Shrinkage. CSA cements have a much higher water demand then OPC products, and utilize most of that water during the hydration process, therefore there is very little water left that would cause shrinkage. Another reason is that because of its high early strength, little or no shrinkage occurs after initial setting.